Friday Okeregbe, a Channels TV reporter who covers the Office of the Secretary to the Government of the Federation, has been kidnapped. 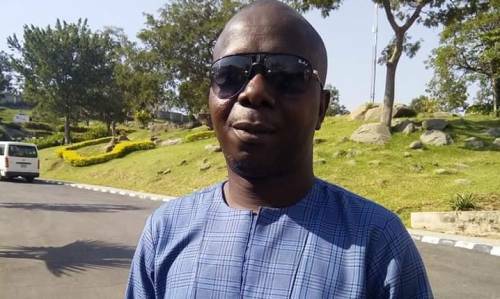 SaharaReporters learnt that Okeregbe was kidnapped along Games Village in Abuja while on his way from his mechanic’s workshop. Those who saw him at work on Friday said he was wearing the same clothes as in the photo insert below. Sources close to Okeregbe’s family confirmed to SaharaReporters that the kidnappers have demanded a ransom of N50m, saying they’re aware he works for Channels TV. The Police, Channels Television and the family are all yet to issue a statement or discuss the incident with the media. SaharaReporters reports that Okeregbe’s wife first suspected something was amiss when she hadn’t seen or heard from her husband as of 8pm on Friday, something very unusual. SaharaReporters was told the family has been in pains since the ransom demand was made, as it has no means of raising the required N50million.